Hello, my children. I am writing this on a pittance of sleep, with my head full of Shakespeare and obnoxious thesis words like ‘perfunctorily,’ so if I don’t make much sense, please forgive me. At any rate, not to be derailed from my goal of reading 70 books this year, I picked a short one for this week, knowing I’d be buried in an avalanche of thesis work. 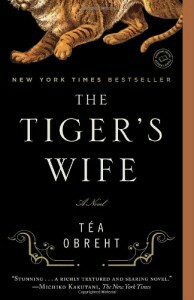 So I read Téa Obreht’s The Tiger’s Wife. The Tiger’s Wife is a difficult book to summarize, because it seems to be trying to tell ten stories at once: a Balkan folk tale about an immortal man, the life story of the narrator’s grandfather, a provincial incident in which an escaped tiger haunts a rural village, the narrator’s experience vaccinating impoverished children in some far-flung corner of her fictitious country, and the origin story of every character to appear in between. This is not to say that there isn’t some overarching narrative thread – there definitely is, but sometimes it’s hard to find. Natalia – the narrator – tells a number of disconnected anecdotes about her grandfather and growing up in an unnamed ‘City’ during an unnamed war. Every other chapter, her grandfather ‘interrupts’ to tell her a story about either (a) the deathless man, a sort of fairy-tale character who helps shepherd lost souls to the next life or (b) the titular ‘tiger’s wife,’ a deaf-mute girl who befriends the escaped tiger stalking the village of Galina. The stories are all interesting enough, but they never seem to go deep enough. The Tiger’s Wife was, for me, an oddly passive reading experience. I was curious to find out what happened next, but I didn’t really care. To be fair, this could have had something to do with how distracted I’ve been this week. However, I think this is one of those rare cases where the book actually wasn’t long enough. By the end of its short 337 pages, we know absolutely nothing about the narrator except that she’s a doctor who likes Bob Dylan. Instead of spending more time letting us get to know her, Obreht spends whole chapters telling us about the life of the apothecary of Galina, the butcher, etc., when the real story isn’t about them. It wouldn’t be entirely unfair to say that The Tiger’s Wife is a collection of short stories masquerading as a novel. Yes, there is a plot that carries the reader from beginning to end, but it clearly isn’t what Obreht had the most fun writing. 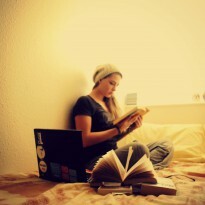 And she is having fun – her writing flows well and is easy to read. But it’s not remarkable. I think the other problem with this book is that there’s no real sense of danger, even though, ostensibly, there’s a war on for a good part of the book. Natalia has nothing to lose, which makes her story kind of casual. The worst thing that could happen is she won’t figure out what her grandfather was doing in Zdrevkov and she’ll carry on with her life. It reads like a fairy tale, but with all the peril removed. Still, I enjoyed parts of this book – partly, I think, because I spent a summer living in Romania and much of the folklore was familiar. It’s an interesting cultural read, if not a literary one, and it does paint a fascinating picture of the war-torn countries that make up the former Yugoslavia. However, I think Obreht would be better suited to writing a collection of modern Balkan fairy tales. The novel doesn’t seem to be quite her style. 2.5 stars. Find it on Goodreads here.